The Digital Summit presented by United Talent Agency in the Johnson Center Theater at Belmont University in Nashville, Tennessee, October 18, 2018. On Thursday, October 18, United Talent Agency (UTA) hosted their inaugural Digital Summit on Belmont University’s campus. The event presented discussions with UTA executives including Digital Strategy Agent Nick Barnes, Head of IQ Strategy Kendall Ostrow, Digital Agent/Emerging Platforms Oren Rosenbaum and Spotify’s Director, Head of Originals Jesse Burton. The summit was open to all Belmont students. 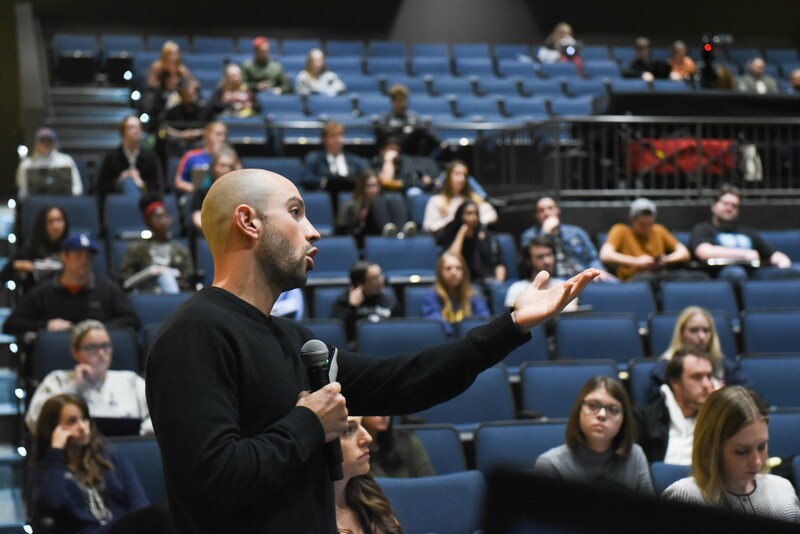 The Digital Summit, conceived by UTA, aimed to educate students on career opportunities in the digital marketplace and explore the current landscape across practice areas such as social media, podcasting and fan retargeting. Three sessions took place including “Retargeting: How to Cut Through the Noise and Market to Your True Fans” by Nick Barnes, followed by “Social Media: What Could go Wrong? Brand Crisis Management in the Digital Age” by Kendall Ostrow and “Creation to Syndication: How to get a Podcast off the Ground” by Oren Rosenbaum and Jesse Burton. Please find a link to photos from The Digital Summit, here.